Tonight, we finally get the episode that should have aired last week. Then, no episodes until April 5 because of March Madness. Meanwhile, cast and crew are still busy filming the last episode of Season 3. Episode 3×17 should have aired last Friday. In some sort of last-minute-rescheduling, CBS opted to preempt the episode for an interview with R. Kelly instead. Sadly, neither the producers nor the writers were aware early of the schedule change and the official, pre-scheduled tweet about the episode airing plus the automatically scheduled tweets by SpoilerTV just added to the confusion. Until the last minute, many fans and even the guest-stars didn’t know about the episode not airing; promoting the show and prompting the fans to watch. Understandably, fans were pretty upset and vocal about it. To top it all, CBS hadn’t deleted the other pre-scheduled posts either; starting to promote Episode 3×18 early on instead of 3×17. Also, no Sneak Peeks yet to make up for all this mess. There hasn’t been much promo for the premiere tonight. Sigh. It’s been a while since the last new episode, so to recap: Episode 3×16 had reached 6.574 million live-viewers and a demo of 0.8. In the +7 Days Ratings, it added another 1.53 million viewers (+23%), reaching a total of 8.108 million viewers with a demo of 1.06 (+36%). The Rerun for Episode 3×06 got 4.387 million live-viewers with a demo of 0.4. For a rerun, that’s not bad numbers. It even had a higher audience number than Hawaii Five-0 (I can’t remember if this has ever happened, actually). For comparison: The reruns of Season 1 had an average of 4.22 million live-viewers and a demo of 0.58. 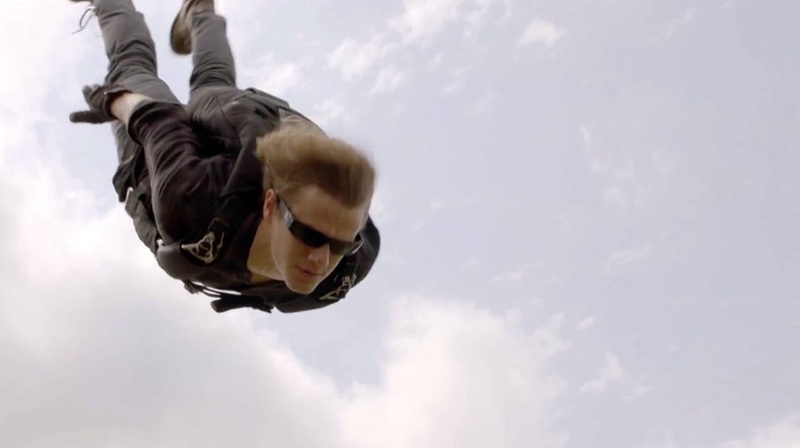 There was no new episode since February 22, so the MacGyver Reboot still has an average of 6.291 millions live-viewers per episode with a demo-rating of 0.73. Compared to the 23 scripted shows on CBS, the Reboot is still at rank 21 in demo and at rank 13 in audience. Let’s take a look at some other CBS crime-action shows in the same range. Magnum PI is at 6.032 million live-viewers per episode with a 0.91 demo-rating at the moment. There is only one episode left to air; so concluding the first season with Episode 1×20 on April 1st. SEAL Team is still at 5.545 million live-viewers and a demo of 0.84 on average. Since they’ve been on a 4-weeks-hiatus, they won’t end the season before May 22. SWAT is at 5.373 million live-viewers with a demo of 0.79, ending the season on May 16. Tonight’s Episode 3×17 is titled “Seeds + Permafrost + Feather”, written by Nancy Kiu and Lindsey Allen and directed by Alexandra La Roche. MacGyver and team are asked to solve a locked-door mystery when a man working inside a remote, ultra-secure international seed vault disappears. There’s guest appearances by Carsten Norgaard and Carlos Leal. Under the Recurring Cast, there’s Reign Edwards, Levy Tran and Tate Donovan listed. After tonight’s episode, there will be a break due to March Madness basketball. On March 11, CBS released the airdates for all their show’s season finales. 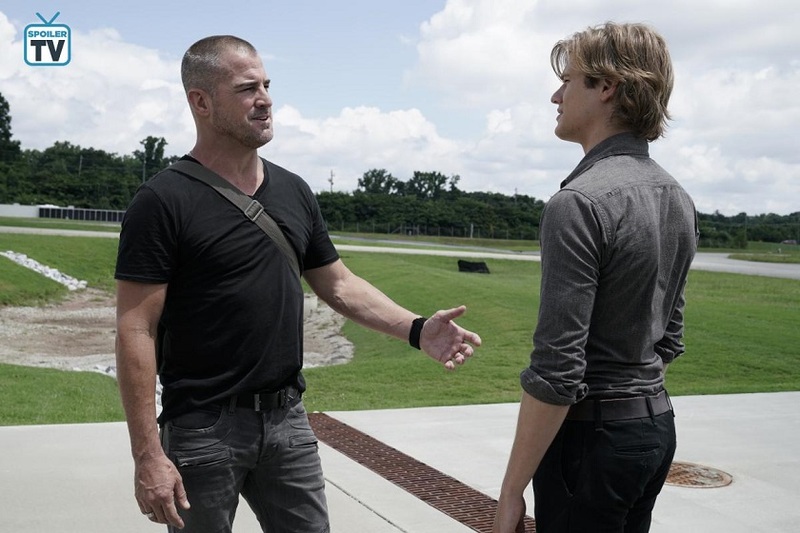 The Season 3 Finale of MacGyver will air on May 10 because there is another short break in between due to the “I love Lucy” special airing on April 19. Written by MacGyver creator Lee David Zlotoff, directed by Roderick Davis. Guest appearances by Michael Des Barres, Andre Reed and David Dastmalchian. The first Official Still was released on February 28 with more Stills added on March 6 (sadly, none of them featureing MDB). Channel CBS46 had been on set for that episode; doing on-set interviews with the cast. Hopefully, they will release more material for the occasion. Guest appearances by Odelya Halevi and Nick Massouh. Written by Nancy Kiu and Lindsey Allen, directed by Stephen Herek. Guest appearances by Lance Gross, Emerson Brooks and Brendan Hines. It’s gotten difficult to determine what filming days were used for which episode. 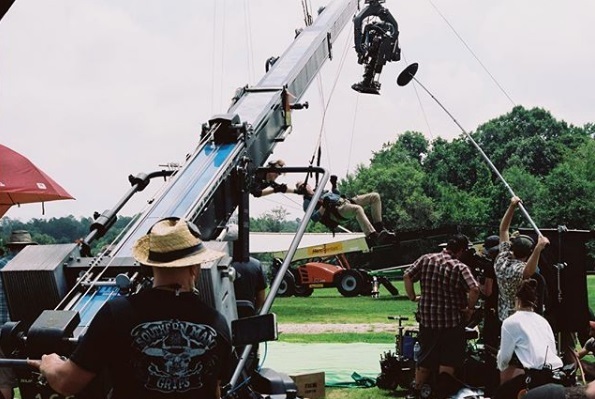 On February 25, they filmed scenes involving power lines and climbing a tower. 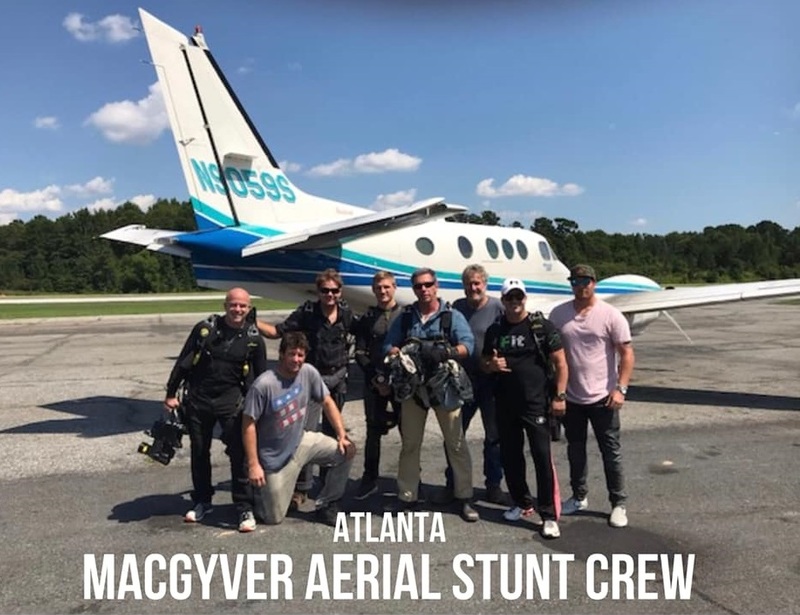 The next days, they filmed scenes at Fulton County airport and at Turner Field, also using a living rat on the Turner Field set. Lucas Till initiated Mustache March; sharing the diversity of the mustached crew on Instagram Live Stories. They also filmed scenes with the black chopper again. On March 11, Lance Gross revealed that he was on a plane back to Atlanta; his hand over the script title page. 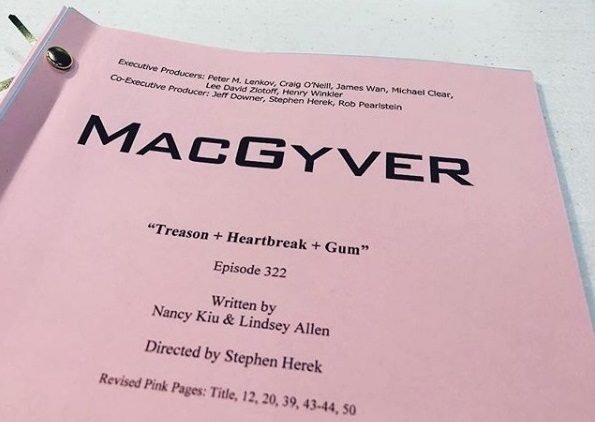 All his secrecy was unnecessary, though since Costume Designer Sarah Downer revealed the title for the Season Finale Episode to us just a few hours later: “Treason + Heartbreak + Gum”. Emerson Brooks posted a photo of Charlie in trouble; sitting in what looks like either a cell or a glass cage. 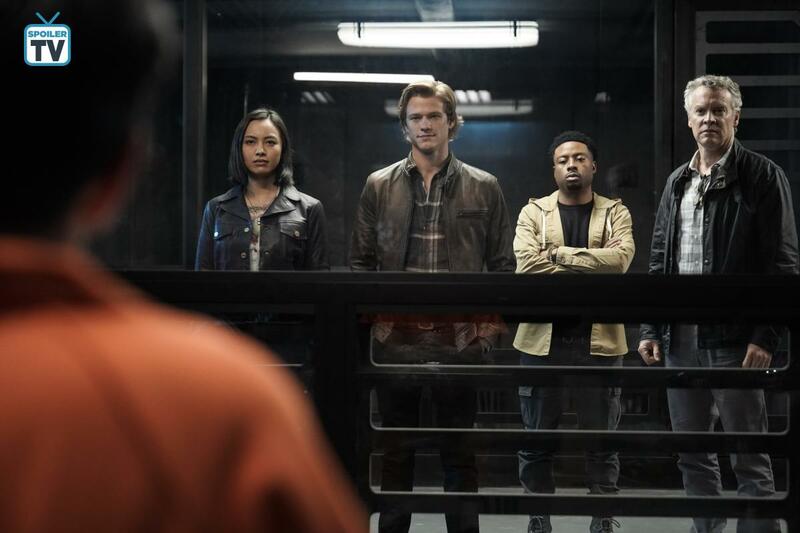 Levy Tran, Lucas Till and Justin Hires filmed on a fake elevator set on March 11 and 12. Brendan Hines uploaded a video of him in the make-up trailer getting the neck tattoo for his character Ethan. 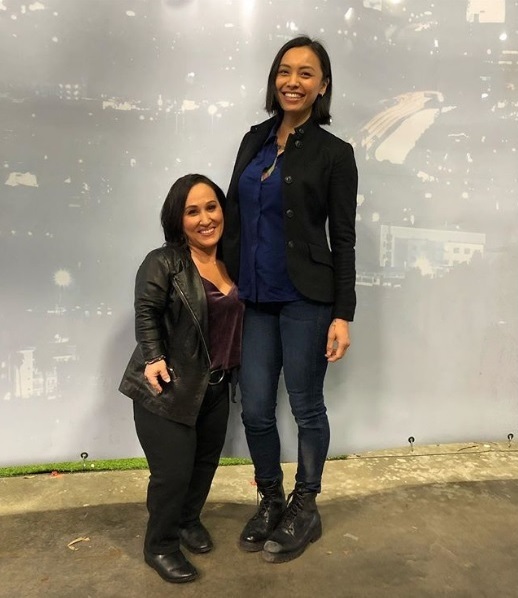 Meredith Eaton posted some stories before filming in an underground parking garage on March 13. On Wednesday, CBS surprised the fans by tweeting a photo for tonight’s episode of MacGyver and Desi – and it looks like they just got busted while sharing the bed. MacRiley fans were not happy, although there is some indication that this might have been another undercover op similar to the ruse used by MacGyver and Riley in Episode 2×03 (Roulette Wheel + Wire). 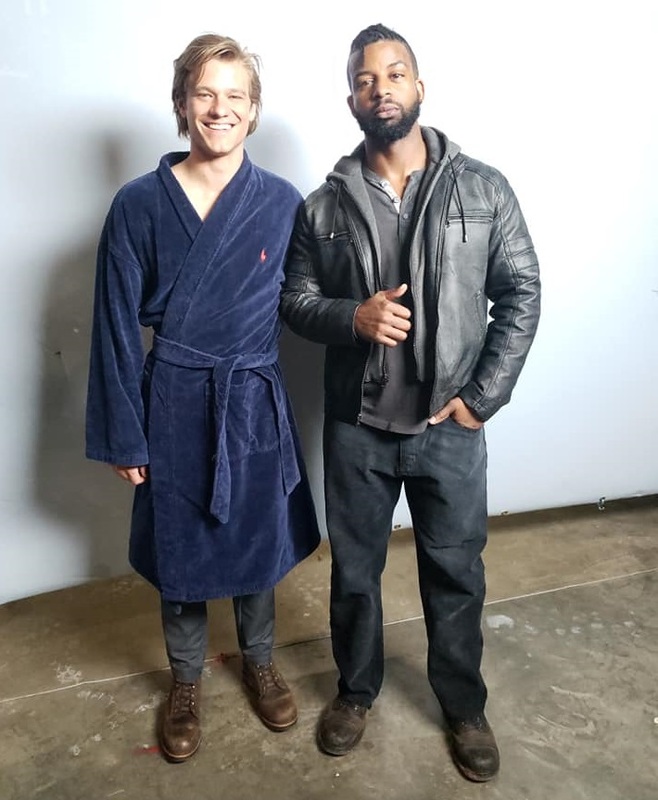 The guy busting in on them is most likely Maurice P Kerry who had posted photos of him with both Lucas and Levy before; Lucas wearing a bathrobe. Yesterday, they continued filming action scenes in the underground parking garage. 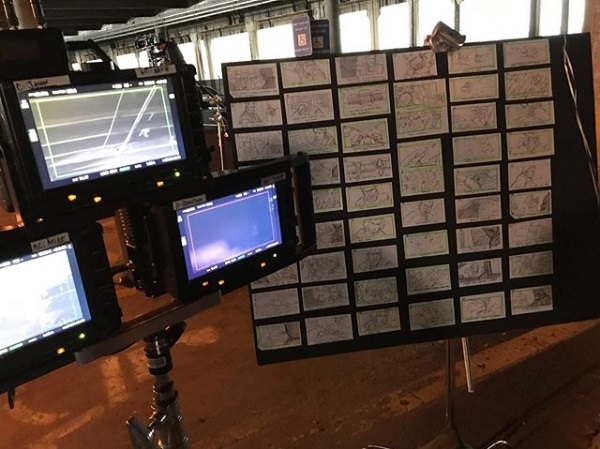 The storyboard photo by Mike Torino, but also the scene preparation with toy cars by stunt coordinator Daniel Hargrave a few days earlier indicate that there might be some big action involving car chases and fighting. Levy Tran shared stories on set, also revealing her leg being black and blue due to the recent stunt work. Sheryl Lee Ralph aka Mama Colton has also been around yesterday. 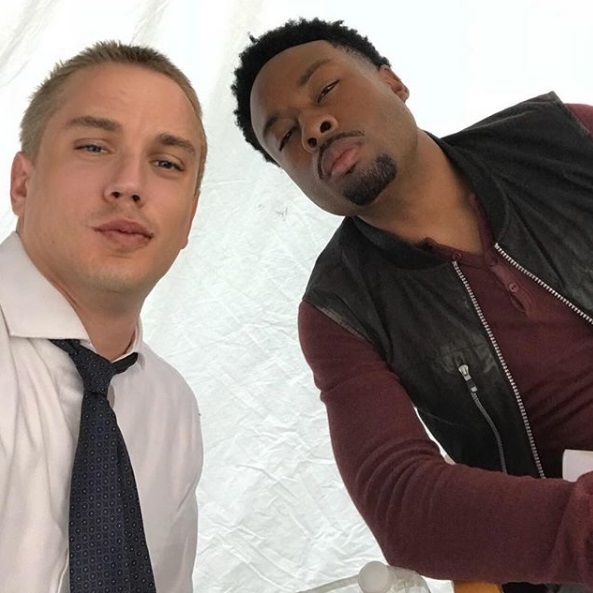 Lance Gross filmed a scene wearing a sharp suit – Instagram Stories by the stand-ins indicate that it will be most likely a dinner date with Billy and Riley. We don’t know yet how many members of the Colton family will show up, but there seem to be quite a lot of characters in the Season 3 Finale. This week, Technical Consultant Rhett Allain uploaded a blog post with science notes about the MacHacks in Episode 1×19 (Compass) and in Episode 1×20 (Hole Puncher). Levy Tran joined the cast as recurring character, but she has been on set for every episode since 3×15 so far, so CBS will surely bump her to a regular if the show gets another season. It also appears that Tate Donovan has been part of most of the episodes being filmed lately, so it’s possible he might be part of a Season Finale plot twist or cliffhanger. 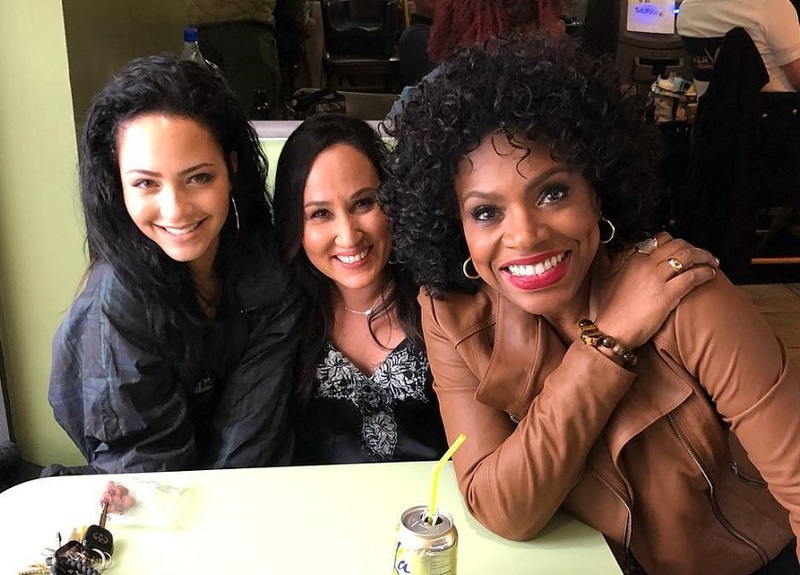 As mentioned above, Emerson Brooks (as Charlie Robinson), Lance Gross (as Billy Colton), Sheryl Lee Ralph (as Mama Colton) and Brendan Hines (as Matty’s ex-husband Ethan) have been on set recently. There’s no indication yet if Billy and Ethan are part of the “Hearbreak” or the “Treason” in the episode title of 3×22. Central Casting Georgia has been looking for a lot of Extras recently; revealing that we might get to travel to Paris and to Russia. In the last two weeks, they’ve been looking for a female Nurse, female Spectators, a male Coroner, for a Tactical Team, Agents and Techs, for Police, Firemen and Paramedics, Russian Guards, Bodyguards, Business People, Europe Wait Staff, for Beautiful Club Goers, for Handsome Club Goers, Business Patrons and Street Patrons, Diner Patrons, for Women Servers, Upscale Europe Restaurant Patrons, Paris Wait Staff, an African American female model for a photoshoot, male Security Officers, for Middle Eastern, Caucasian or Hispanic Security Guards and for Maintenance Workers. 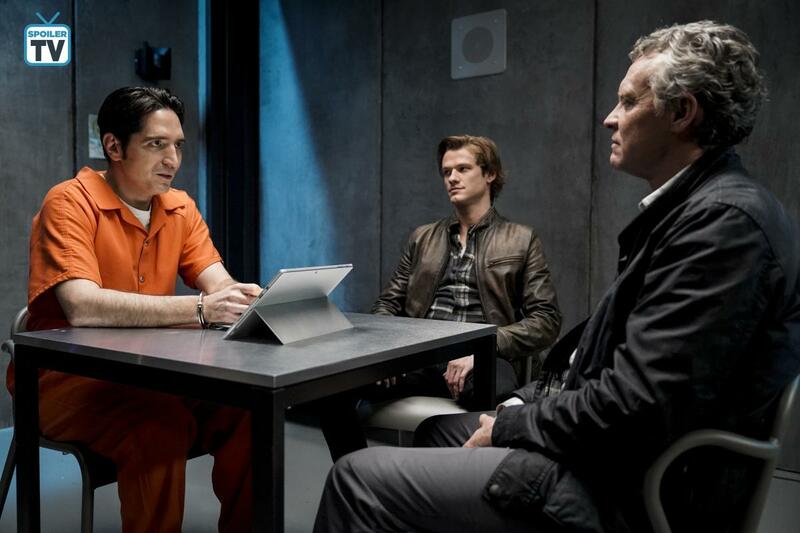 French MacGyver fans are lucky since channel M6 will start airing Season 3 tomorrow at 9pm. 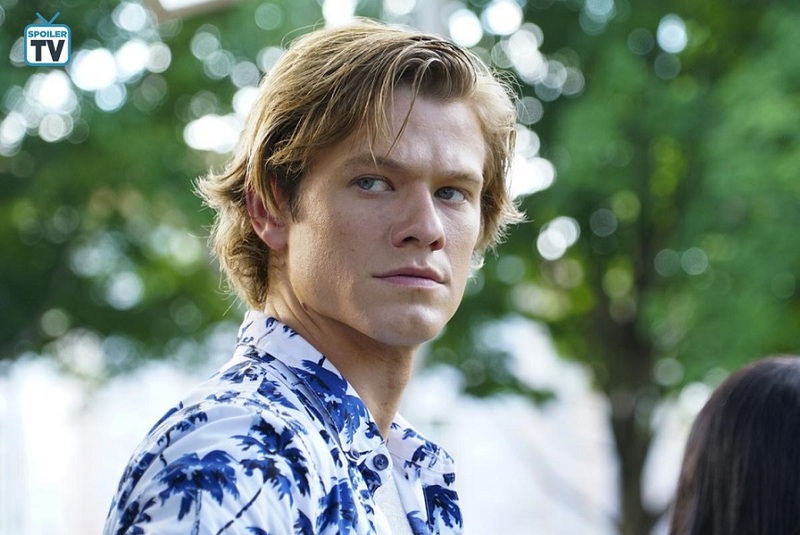 In case you missed it: The confirmed guests for the MacGyver panel on March 23 at the Paley-Fest LA so far are Lucas Till, Tristin Mays and Meredith Eaton. Justin Hires has a stand-up comedy gig in Washington that day and won’t be able to attend. Tickets are still available for the event moderated by Kevin Frazier (Entertainment Tonight)! Matt Carter talked with Executive Producer Peter Lenkov about the Reboot in an interview posted on March 7. He also teased an upcoming interview with Michael Des Barres in April (presumably on April 5 before the premiere of Episode 3×18). Only three votes more and the Reboot would have placed Rank 3. Again, Ranks 4 to 7 are only one or two votes apart, so our lead hero could have placed 4th with only three votes more. It placed better than many fan favorites dominating the awards for years and ranks 2, 3 and 4 are only a few votes apart. Only five votes more and the Reboot would have placed 2nd in this category. Maybe some more votes by fans might get the Reboot to win in some of the categories next year *hint hint*. Episode 3×02 premieres today! While Cast and Crew work on Episode 3×09, the famous social media game “Where’s George?” is going into another round. CBS took its sweet time to start promoting Season 3. A day before Premiere Day, they finally released 3 Sneak Peek videos. On Friday, ET Online added another, Exclusive Sneak Peek of Mac and Oversight parachuting through crossfire. A few hours later, CBS released an additional Sneak Peek as well, making it 5 Sneak Peeks in total. Some of the stunt and guest actors started posting “old” photos and videos from the filming process done back in July; e.g. Richie Stephens or Matthew Albright. Sibongile Mlambo uploaded a photo of her character’s different costumes. According to aerial stunt coordinator Carl Anthony Nespoli on Facebook, the parachuting scenes have been done for real. Yan Dron and Troy Hartman did the main jumps; also lighting the canopy on fire. 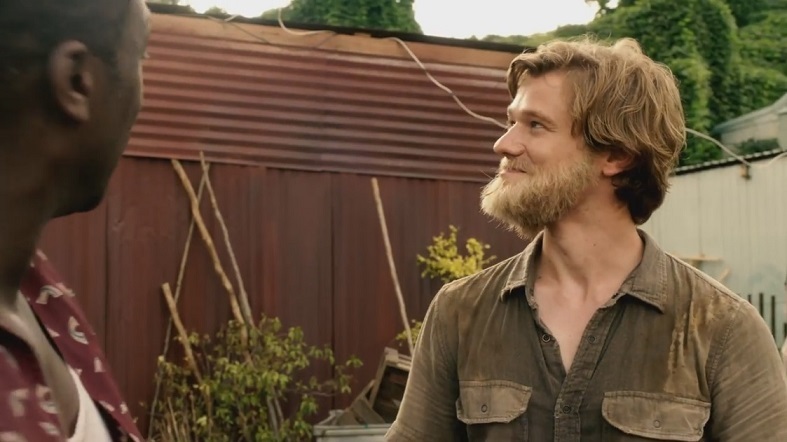 I hope we see more of this as a Season 3 Featurette soon. It also holds up pretty well against some of the other CBS action dramas that got a lot more promo in recent weeks and have a lot more ad-value simply due being a non-Friday-show. For comparison: Magnum PI is at 7.08 millions / 1.05 demo (Monday) after airing two episodes so far, SEAL Team at 5.02 / 0.8 (Wednesday, 1 episode) and SWAT at 4.95 / 0.75 (Thursday, 2 episodes). When Jack receives an emergency distress signal from one of his old Delta buddies who is falsely accused of terrorism in a foreign country, MacGyver and Jack quickly recruit the rest of Jack’s old Delta team and stage an unsanctioned rescue op. For this episode, Reign Edwards as Leanna is listed in the recurring cast. To be honest, I don’t know anyone of the guest cast. On September 27, Executive Producer Peter Lenkov had uploaded a short video; stating that one of his favorite artists will provide a song in the Episode. 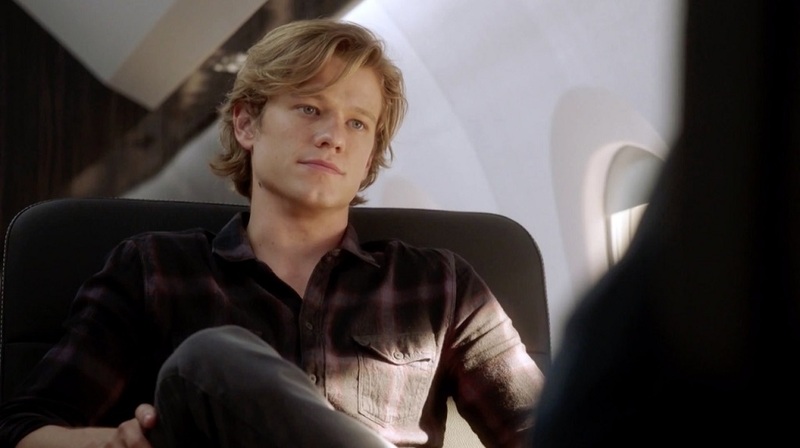 (The scene is MacGyver and Jack talking with Mac apologizing while fetching a few beers in MacGyver’s kitchen; later being joined by Matty.) As Kristin Diable revealed, the song hasn’t been released so far, marking this episodes as its world premiere. CBS had uploaded some Sneak Peeks onto their YouTube account. Sadly, they put up the Sneak Peeks for last week’s episode 3×01 again. They have released 4 Sneak Peeks in total, but as I’m typing this post, they still haven’t corrected their error 16 hours later. Bit of a pity that of all the CBS shows it seems to be MacGyver that gets either a wonky form of promo or no promo at all. Directed by Tessa Blake; following the storyline of Team Phoenix going undercover on a college campus. Guest appearance by Lance Gross (as Billy Colton). Directed by Peter Weller, this episode has Riley and Mac driving a tanker filled with liquid oxygen through a war-torn region to deliver it to a children’s hospital. For the first Official Still released on Monday, you can check the Press Release here. Halloween Episode, directed by Eagle Egilsson. Directed by Stephen Herek. Guest appearances by David Dastmalchian (Murdoc) and Brady Bond (Cassian). It looks like the fans get at least 8 weeks of uninterrupted fun. There might be no episode on November 23rd, though (due to Thanksgiving). On September 24, production started on Episode 3×08, directed by Lily Mariye (Emergency Room). They filmed in “Paris” and in “Afghanistan”, joined by Emerson Brooks (as Mac’s EOD friend Charlie Robinson) and Holland Roden (known for her work in the TV-Show Teen Wolf). The cast posted a ton of Instagram Live Stories; making up for lost time and promoting the Season 3 Premiere. On Friday, they’ve filmed scenes for a Foundation Dinner with Military Vets; some of them sitting in a wheelchair. The cast got to wear tuxes and dresses. On Monday, production continued in Atlanta. As revealed by dozens of Instagram Short Stories, the filming was a “smelly” adventure. The crew had to MacGyver their own nose-plugs with tissues or ear-plugs to keep the smell away. 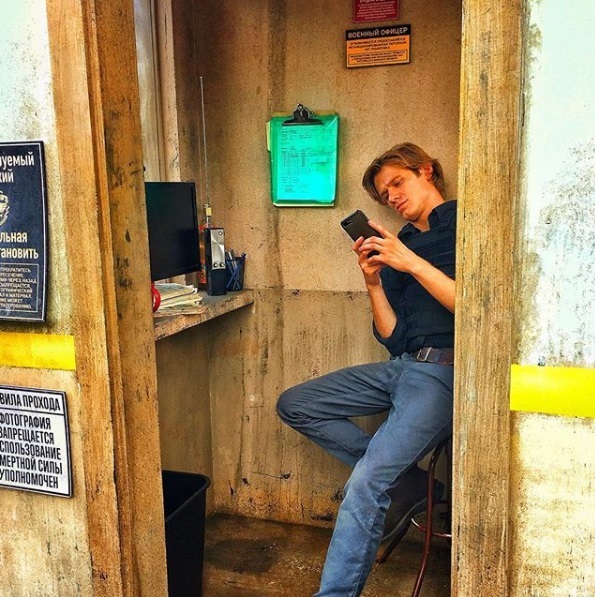 On Wednesday, Lucas Till gave a shout-out to the wardrobe crew; announcing it was going to be a “dirty day”. On the photo uploaded by Justin Hires, his clothes looked still clean, though. Holland Roden posted a photo of herself in a pretty black dress, indicating she might be part of that Foundation Dinner scene. Yesterday, Justin Hires uploaded a photo of Mac, Bozer, Charlie and Riley around Mac’s fireplace. Because Jack is missing in the photo with everyone looking pensive and because George Eads hasn’t been seen on set for Episode 3×08 yet, fans keep asking the cast, the writers and the producers if George has left the show. Indeed, Peter Lenkov promised to make sure we’ll get to see more photos with Jack in it. 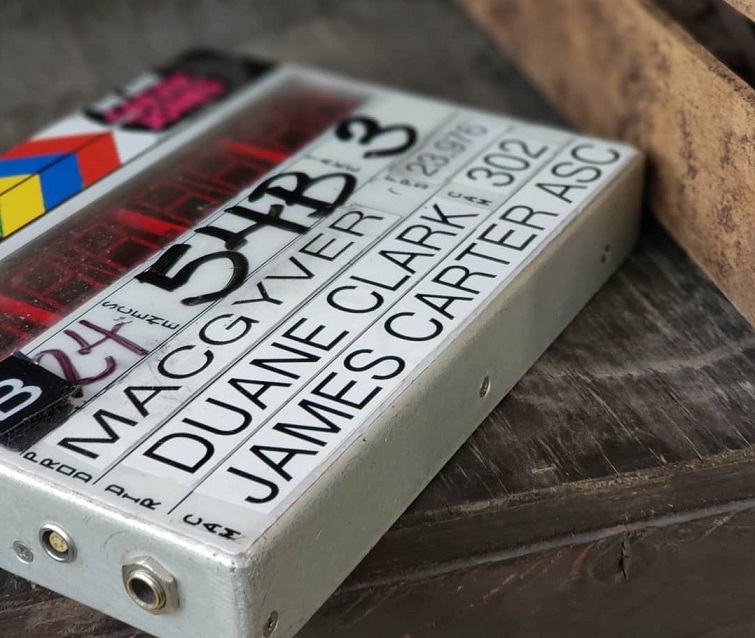 With showing us the script title page, Tristin Mays revealed on Wednesday that Episode 3×09 is titled “Specimen 234 + PAPR + Outbreak”, written by Lindsey Allen and directed by Michael Martinez. Sounds dangerous. PAPR could be a Powered, Air-Purifying Respirator, so the perfect tool for a MacGyverism. Lance Gross was back on set as Billy Colton yesterday and early morning today; uploading a few BtS videos as Short Stories on Instagram. Reign Edwards wrapped the pilot for “The Wilds” in New Zealand and arrived back in LA a few days ago. 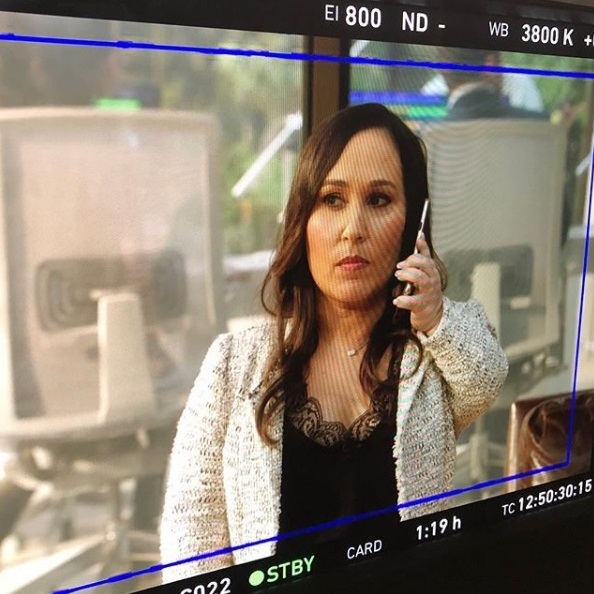 Theoretically, it’s possible for her character Leanna Martin to be back on the show by Episode 3×09, but we don’t have any further information yet. Central Casting Georgia had posted Casting Calls for Stand-Ins for a bald actor and for some of the main actors. They’ve also been looking for Extras; e.g. for a Diner Patron, Background Actors for an European Airport, for Police and for Guards. Overall, not many Casting Calls lately. The Season 2 DVD of the Reboot was released in the US on September 18, and there’s even loads of bonus material on it this time! Season 1 of Original MacGyver is still set to be released on BluRay on October 30. CBS even started doing promo for it. Original MacGyver fans keep posting about both the MacGyver Funko Pop and the Escape Room Board Game; appreciating to finally have some “Mac Swag” after all these years. To recap: Episode 2×22 (UFO + Area 51) managed 1.79 million live-viewers, followed by the Season Finale Episode 2×23 (MacGyver + MacGyver) with 1.68 million live-viewers. Both episodes got a demo-rating of 7.4. Overall, Season 2 had about 1.73 milllion live-viewers on average per episode and a demo-rating of 8.62. This is less than Season 1 reached (1.79 million live-viewers, demo 10.0), but enough to make the network happy. Also, the demo-ratings were better than Season 2 of Lethal Weapon airing in the same time-slot just before and better than SEAL Team episodes airing on the same day at 10pm. The Original S1 BluRay is listed now on Amazon for preordering (release date: November 8). Weirdly, they put an FSK16 rating (16 years and older) on it – although the initial release on DVD is FSK12. Guess MacGyver in HD is too much to handle for some people *lol*. Tonight’s the Night – it’s the Season 3 Premiere! After months of waiting, fans finally get to find out about the consequences of MacGyver quitting Phoenix in the Season 2 Finale. CBS took its sweet time to start promoting Season 3. Last Friday, we finally got a Season 3 Premiere Teaser Trailer; posted on Instagram just before the rerun of the Season 2 Finale. Considering all the other CBS shows got previews weeks ago and Sneak Peeks days ago, it’s no wonder fans had started complaining about the lack of promo so shortly before the start of the new Season. Yet, CBS still left it upon the cast, the crew and the fans to promote the upcoming Season and the DVD release of Season 2. There was no promo for the DVD at all. They aired a slightly longer preview after the rerun of Episode 2×23, but it wasn’t posted on the other social media sites until Monday. 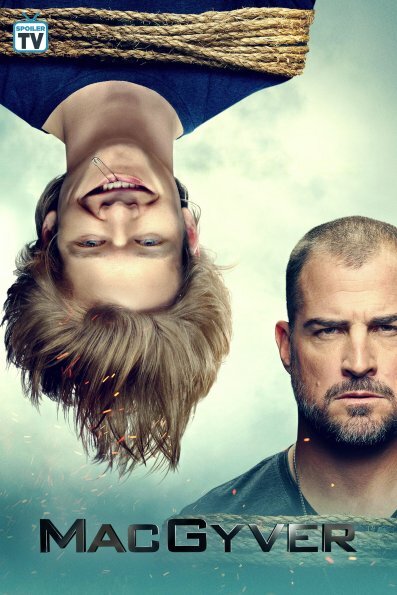 On the same day, they released the Official Season 3 poster – it’s the one of MacGyver hanging upside down; safety pin ready while Jack angry-stares into the void. It’s sure memorable and fun, but again feels overly photoshopped to me. Three months after quitting the Phoenix Foundation and moving to Nigeria, Mac puts aside his differences with his father and returns when he hears Jack is the target of a murderous dictator he double-crossed. Yesterday, CBS finally released 3 Sneak Peek videos. 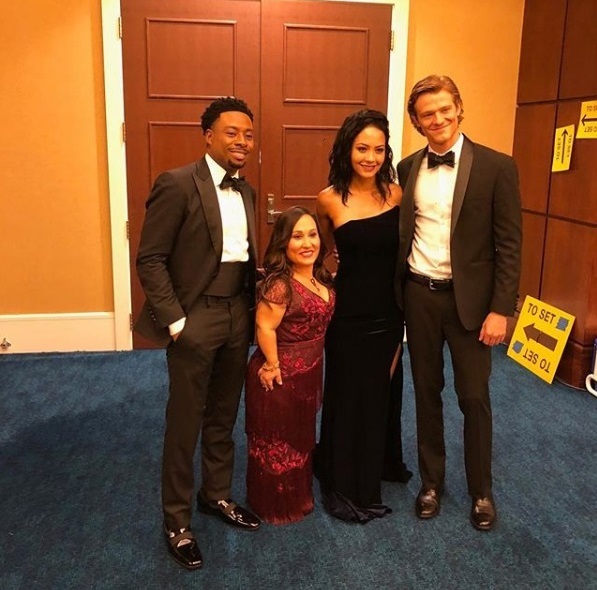 One is of MacGyver and Oversight on a plane, the second one of Bozer and Leanna undercover in military uniforms with Riley helping out from home. The third one is of Oversight arriving in Nigeria in a helicopter, telling Mac that Jack is in trouble and needs help. Today, ET Online added an another, Exclusive Sneak Peek of Mac and Oversight parachuting through crossfire. Since they’re listing real aerial stunt coordinators on IMDb, it’s possible the stunt people did a real jump for the footage. Maybe we’ll get to know more in upcoming interviews or BtS material. Nearing the Season Premiere, some of the guest and background actors started posting “old” photos from the filming process done back in July; e.g. Richie Stephens with Lucas Till and with Justin Hires. Directed by Duane Clark; centering around Jack and his old Delta Buddies. For Official Stills, see here. Directed by Tessa Blake; following the storyline of Team Phoenix going undercover on a college campus. For Episode 3×07, production filmed in “Ghana”. Locations were a bank, a street market and a restaurant. They also filmed several days on a set dressed as a junk yard, a location set up as a car accident scene and nearby a lake. After making friends with snakes, filming continued in the War Room on September 21. The posts by crew and extras revealed that the heavy schedule was starting to take its toll – after almost 60 days into production, many complained about being tired; posting photos of their colleagues taking a nap whenever and wherever possible during breaks. Of course, the heat in Atlanta didn’t help. Luckily, they actually got the weekend off for once. Justin Hires continued to post a few BtS photos from set – e.g. 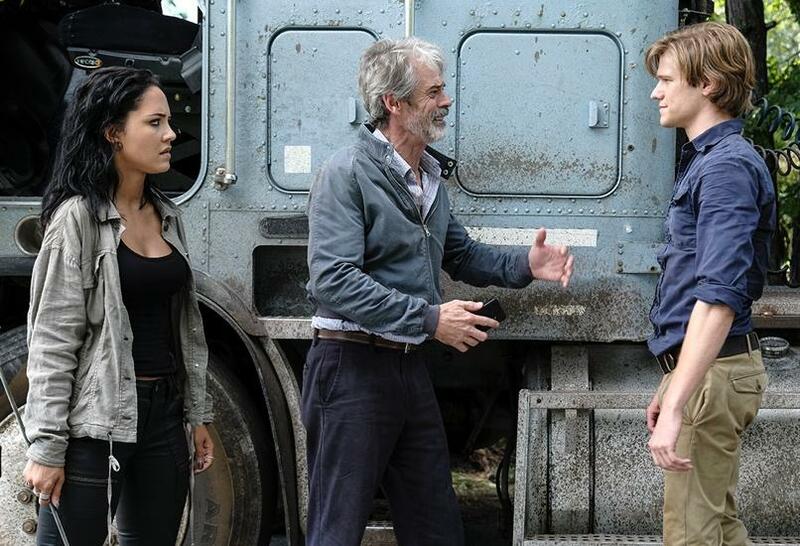 of Bozer under a car (or rather, a truck) for once or of him with Lucas Till and Joy Sunday, listening to the director’s explanations. On Monday, production started on Episode 3×08, directed by Lily Mariye (Emergency Room). They filmed in “Paris” and did scenes with costumes including a tac vest; revealing that Mac’s EOD friend Charlie will be in this episode. We don’t know yet for sure if “The Ghost” will be back as well, but it seems reasonable since he never got caught. On Wednesday, the cast started posting new BtS photos. 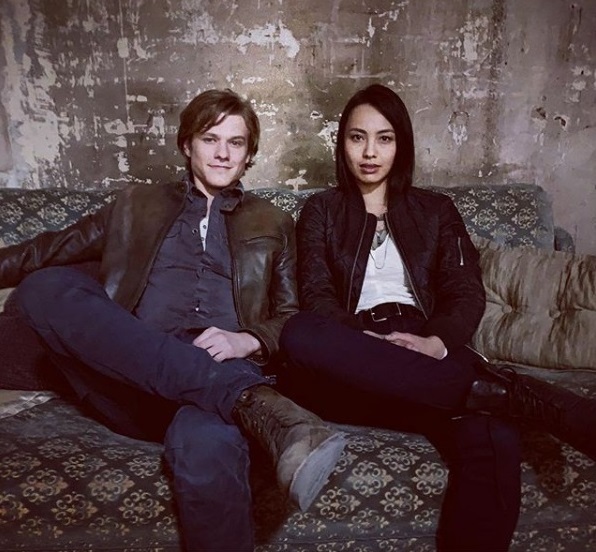 Meredith Eaton uploaded a photo of her with Lucas Till. 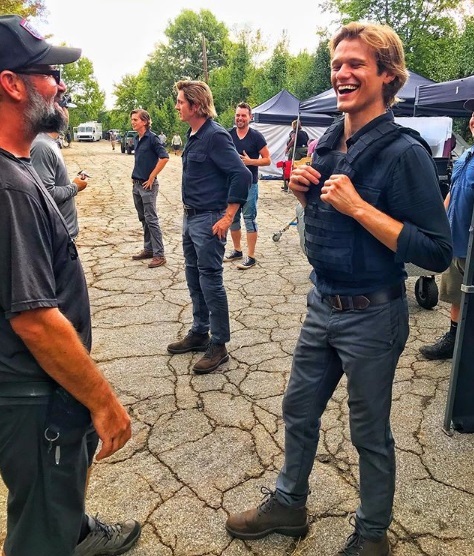 Lucas posted one of MacGyver waiting for security in Chechnya and one of him standing next to a Stunt Double and a Stand-In; pointing out that he was the one wearing a vest. 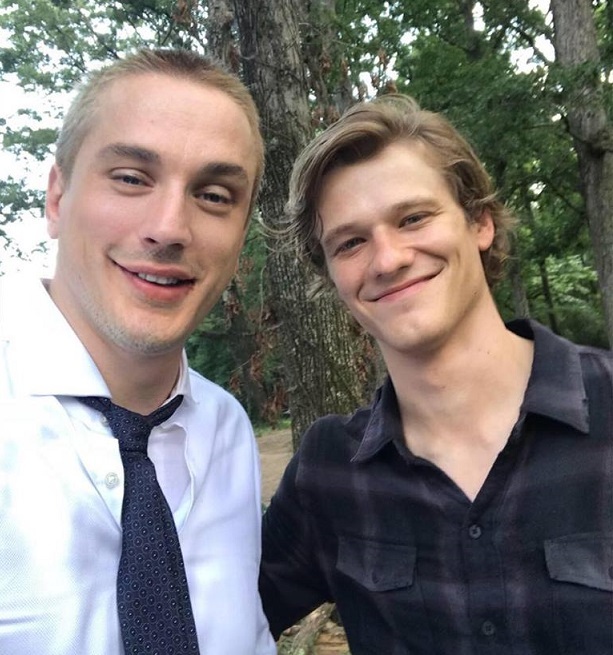 Yesterday, they filmed scenes with Lucas in MacGyver’s EOD soldier gear, so it looks like they’re doing another episode with flashbacks to Mac’s and Charlie’s time in the Army – so maybe we finally get to know how they first heard about and started chasing The Ghost? The cast posted a ton of Instagram Live Stories; making up for lost time and promoting the Season 3 Premiere. 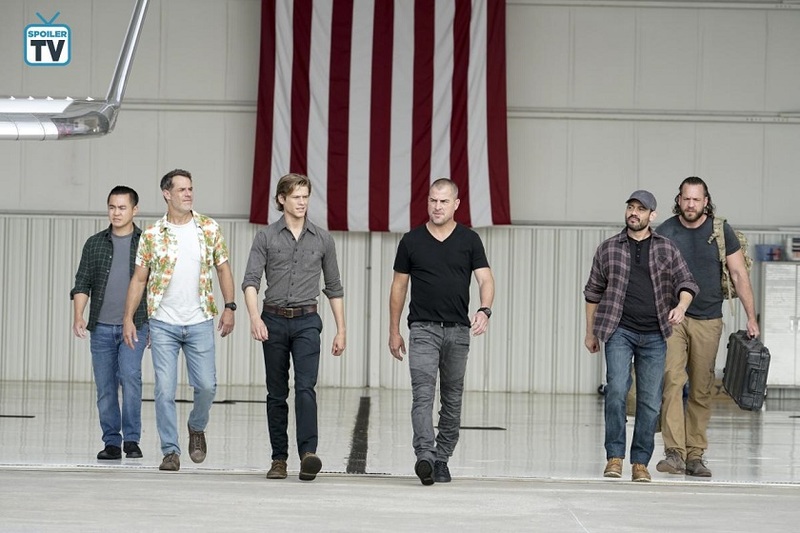 Tristin made the cast do a funny catwalk routine (sadly, George Eads was not on set yesterday to join in on the fun). Justin Hires finally got a Stand-In that looks like him. He also provided some photos of older episodes; e.g. of his favorite Episode 3×03. Today, they’re filming a scene for a Foundation Dinner with Military Vets; some of them sitting in a wheelchair. 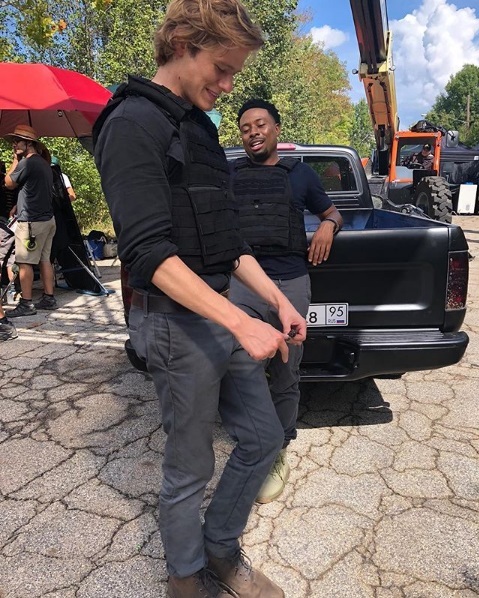 Again, the cast has to wear tuxes and dresses for an episode, which they don’t seem to mind after running around in tac gear and uniforms out in the rain yesterday. Just a few hours before, Lucas posted another BtS video of him getting dressed in that weird prisoner jumpsuit diver costume. Reign Edwards started filming the pilot for “The Wilds” in New Zealand, so it’s not clear if and when her character Leanna Martin will be back on the show. For now, Episode 3×03 will be most likely her last appearance. Sibongile Mlambo had been in Atlanta again recently, and since she’s listed on Episode 3×06 on IMDb together with David Dastmalchian and Brady Bond (as Cassian), I’m assuming she might not be back again, either. 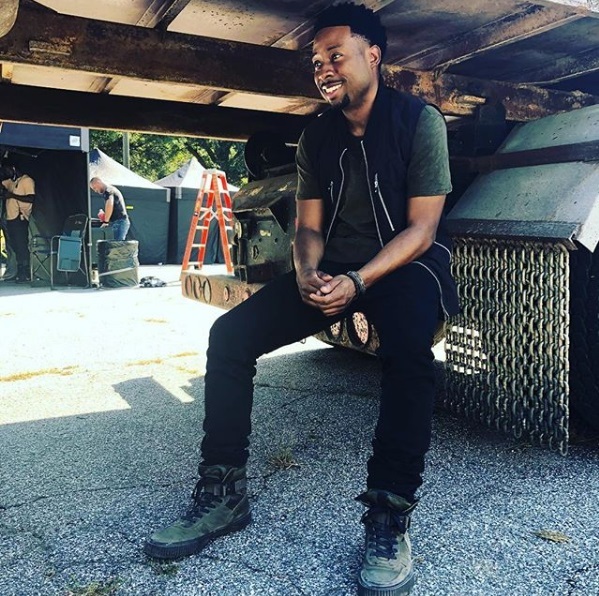 Justin Hires joked about Joy Sunday playing Bozer’s sister, but since he also jokes about MacGyver (or everyone) dying in the episode they’re filming at the moment, I’m not sure if this is true or not. 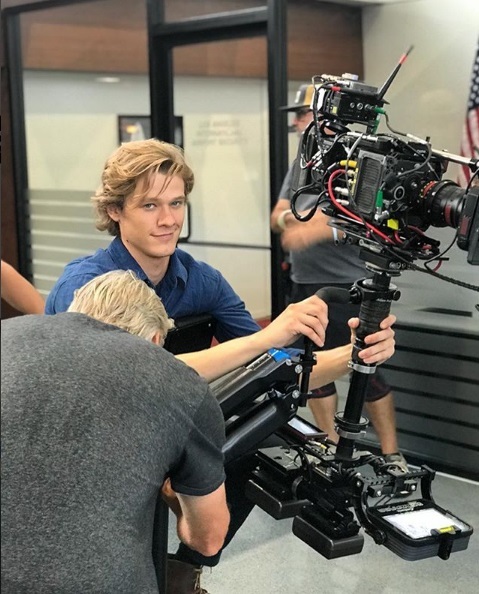 What we know is that Emerson Brooks (who plays Charlie Robinson) plus Holland Roden (Teen Wolf) were on set this week. Central Casting Georgia had posted Casting Calls for Stand-Ins for Emerson Brooks and Holland Roden and a Photo Double for Sarah Sokolovic. They’ve also been looking for Extras; e.g. for European Background Actors, a female Stand-In with red hair, Female Techs, an Attractive Male for a Photoshoot, a Caucasian Male to portray a Dead Soldier, for someone to portray a Politician in a Photoshoot, for Female Military, for Bartenders and Wait Staff, people attending a Foundation Dinner, for someone with access to a wheelchair to use as a prop, for Police and for Military Vets. There was a rerun of the Season 2 Finale Episode 2×23 (MacGyver + MacGyver) in the usual timeslot last Friday – the only rerun during hiatus, in fact. The episode pulled in 3.71 million live-viewers with a demo-rating of 0.4. This is not as much as the reruns of Season 1 garnered last year, but fits in with other reruns on Fridays – especially when considering that this was the only rerun and there was no promo surrounding it. The Season 2 DVD of the Reboot was released in the US on September 18, and there’s even bonus material on it this time! Season 1 of Original MacGyver is still set to be released on BluRay on October 30. Other countries had been gearing up for the Season 3 premiere as well. Since they didn’t have any material of Season 3 yet, they resorted to old material. AXN Asia used Season 2 footage for their teaser trailer; adding the Official Poster in an an altered, pink color design. To recap: Episode 2×20 (Skyscraper – Power) had reached 1.8 milllion live-viewers in total (3 years and older), while Episode 2×21 (Wind + Water) had 1.71 million live-viewers. Both episodes garnered a demo-rating of 8.6 in the targeted age-group (14-49 years old). Episode 2×22 (UFO + Area 51) managed 1.79 million live-viewers, followed by the Season Finale Episode 2×23 (MacGyver + MacGyver) with 1.68 million live-viewers. Both episodes got a demo-rating of 7.4. After airing the Season 2 Finale last Monday, Sat.1 started airing reruns of S1 (Monday night, around 1am). I’m confident that they will also air Season 3 next Summer. Disclaimer: My original guest-post was first published on The MacGyver Project on September 30, 2016. I made some minor changes (e.g. grammar or source corrections, link corrections, additional pictures) before re-posting it on my own blog for safe-keeping. The filming crew has been shooting lots of interior scenes – which is why we didn’t get many pictures from bypassers this week. Or we did get pictures, but there wasn’t much to see. An Instagram picture by James Grabowski revealed information for Episode 7 – it’s titled “Can Opener” and will be directed by Omar Madha (Scorpion, Grimm). According to IMDb, the still untitled Episode 6 is directed by Alec Smight (CSI: Las Vegas). We also got some more information about the jobs being done behind the scenes; e.g. by Picturemill while creating the opening sequence or by Kevin Marshal Pinkney (Stand-In for Justin Hires). Aina Dumlao revealed on September 29 that she’s doing post work (probably ADR) back in California for Episode 4. 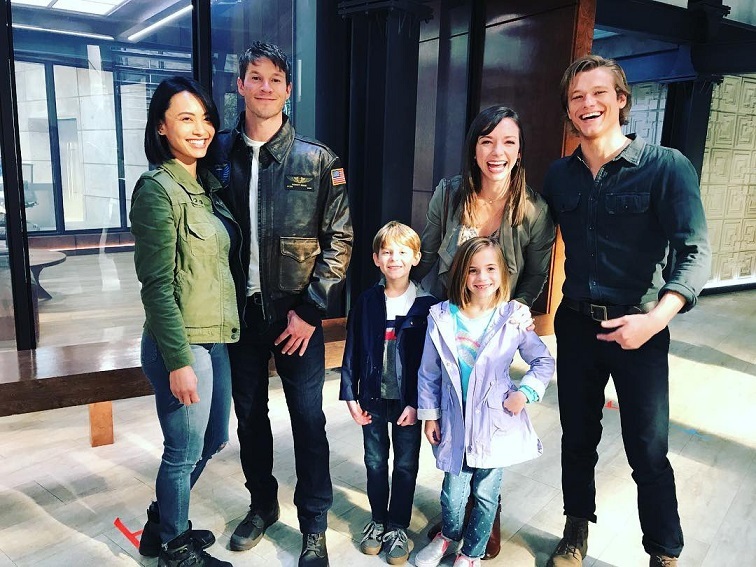 Briana Lamb, Stand-In for Sandrine Holt, started “MacGyverMonday” to teach us some more about her stand-in work. 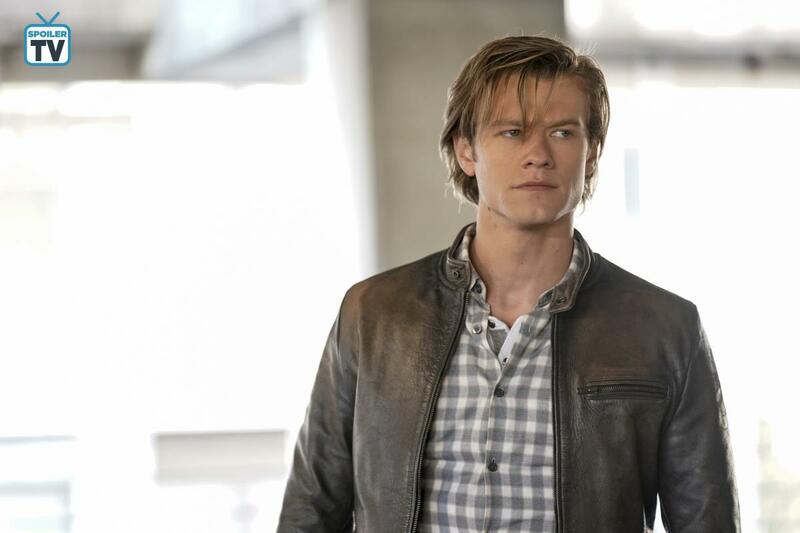 Lucas Till revealed the secrets of his MacGyver Diet. Thanks to a video he posted on September 30, we finally know how they do “dirty work” – I mean, how they dirty up clothes for TV shows. Despite the many negative and critical reviews of the pilot episode beforehand, people sure were curious to check it out for themselves. Almost 11 million people had been watching the premiere; making it Friday’s most watched show. Another 5.4 million had been tuning in for the rerun on Sunday. SpoilerTV provided us with official stills and/or press releases for Episode 2 (Metal Saw), Episode 3 (Awl) and Episode 4 (Wire Cutter). The stills and press releases don’t reveal too much, but they sparked interest. It seems the reboot will continue to resemble first season storylines of the original show. We got several previews and sneak peeks for Episode 2 – the official preview that aired after the pilot episode, one by TVLine, one by The Wrap and another one by MSN. I guess the last one has the scene where George Eads accidentally got punched for real (as had been revealed during promo cycle). During the days before the premiere, several interviews had been posted online. An interesting interview by Slash Film had Peter Lenkov and Pilot Episode Director James Wan talk about the new theme song. Most modern TV shows don’t have opening sequences anymore and Lenkov revealed that they practically had to fight for an opening sequence and a theme. Central Casting Georgia has made a casting call for guards and inmates. 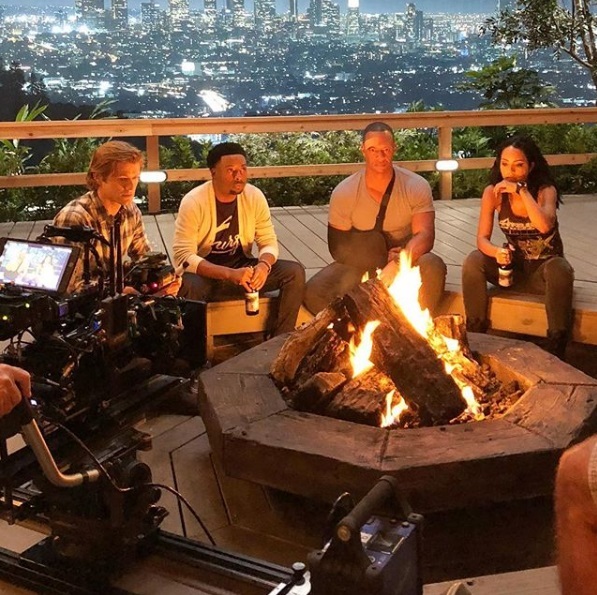 Artist LeShae Nash posted pictures of the interior set and the fire pit in MacGyver’s home she’s been working at. Another old aquaintance from the original show will make his appearance on Episode 6: Charlie Robinson from Episode 1×14 (Countdown). Emerson Brooks tweeted a first picture of him on September 28, wearing a bomb defusal suit. Will Riley Davis do more than just hacking in later episodes? Tristin Mays visited the “Girls Rock Science” weekend at Pittsburgh’s Carnegie Science Center. Besides learning more about water pollution at the exhibits, she also posed for fan pictures.